yes, I know it's been a while since I posted. Since I'm linking to so many recipes from FB, it seemed like overkill to be reposting my versions of them here. That said, since I created my own 'recipe' (I use the term loosely) tonight, I felt I had to share. I've been craving pesto for a few days, and last night, I had defrosted a pack of extra-lean ground beef.....so I figured, why not make mini-meatballs, and serve with veggies, pasta and pesto. As a bonus, I visited the farmers' market on the weekend, so I had a surfeit of luscious (and a bit overripe) heirloom tomatoes, some pattypan squash and a whole whack of basil. EVEN BETTER. 2. Preheat oven to 400F. 3. 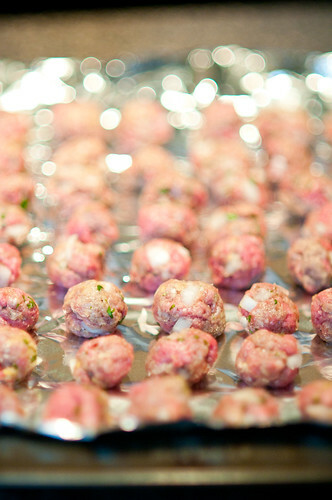 Form into about 50 mini-meatballs and arrange on cookie sheet (I cover mine with foil because I"m lazy and hate handwashing). 1. 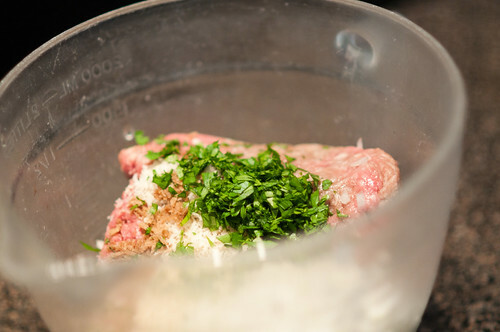 While meatballs are baking, put large pot of water on for pasta. 2. 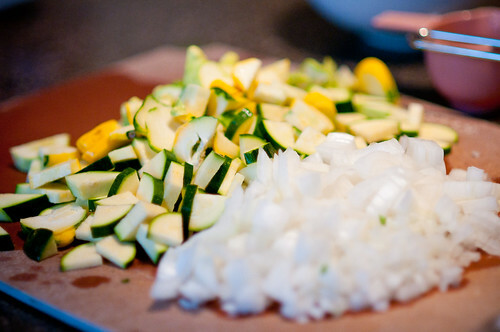 Chop your onion and sauté veggies. 3. In a large skillet, heat olive oil and cook onion and veggies for about 10 minutes or so (until they reach your desired softness). 4. Cook pasta according to package directions (and meanwhile, chop your tomatoes, basil and bocconcini). 5. Drain pasta (don't rinse). Return to large pot (turn burner off). 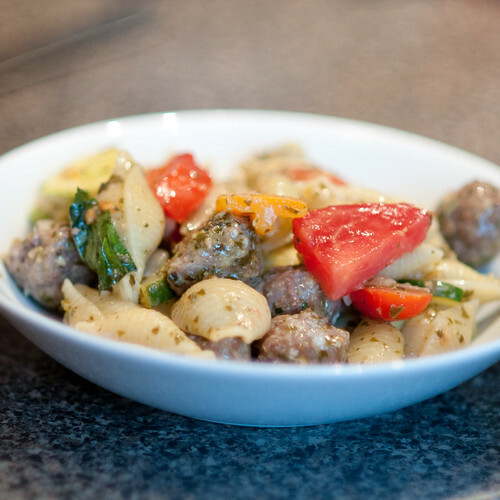 Combine pasta, pesto, meatballs and sautéed veggies. Gently stir in tomatoes, bocconcini and basil. Because it's freaking AWESOME. I had two servings. Hubs had two servings. Lil Z also had two servings, and there are still 5 containers of leftovers left. This easily would serve 8 hungry people. 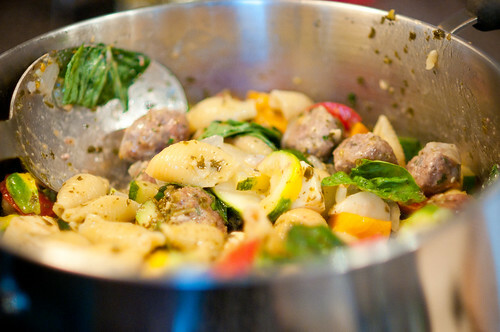 I just loved the heartiness of the pasta and the meatballs, with the freshness of the heirloom tomatoes and basil. And the chewy melty bites of bocconcini were just the perfect little treat. If you didn't have bocconcini, you could just grate some of your favourite aged cheese overtop (grana padano, parmigiano, etc.). Very nice explained recipe. 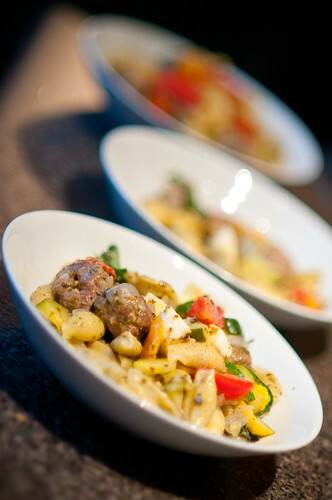 Food looks wonderful on the photos!